When I first got the synopsis for this book, I was wowed! As a pre-teen who has gone through moments of confusing feels for my female and male friends, I wish I had some help sorting out these feelings. For any young person who has experience a crushed on either girl or boy or both, Star-Crossed is invaluable to young readers struggling to sort our these feelings. Thank you Karin and Alyson for this great opportunity to work on this project. It was a treat to work with all of you. And thank you Barbara for writing this great story. This piece was created in response to a call for artists for the Silver Millennium Masquerade Ball at Saratoga Spa State Park in New York. I decided to illustrate Sailor Moon and Sailor Chibi Moon based on one of my favorite moments from the Sailor Moon Anime, in which Sailor Moon and Chibi Moon come down from the sky after having defeated Queen Nehellenia. The final piece was created with paper and gouache. Before I start on the paper cut, I like to make color thumbnails to figure out my color palette. I went through multiple color palettes for the environment. I decided on the blues, because ultimately, it seemed most fitting. Before making the color palette, I begin with a template / final sketch of the illustration. This enables me to work digitally or in paper. As of October I've been diligently doing an piece for Inktober. In doing so, I stumbled on an new style. 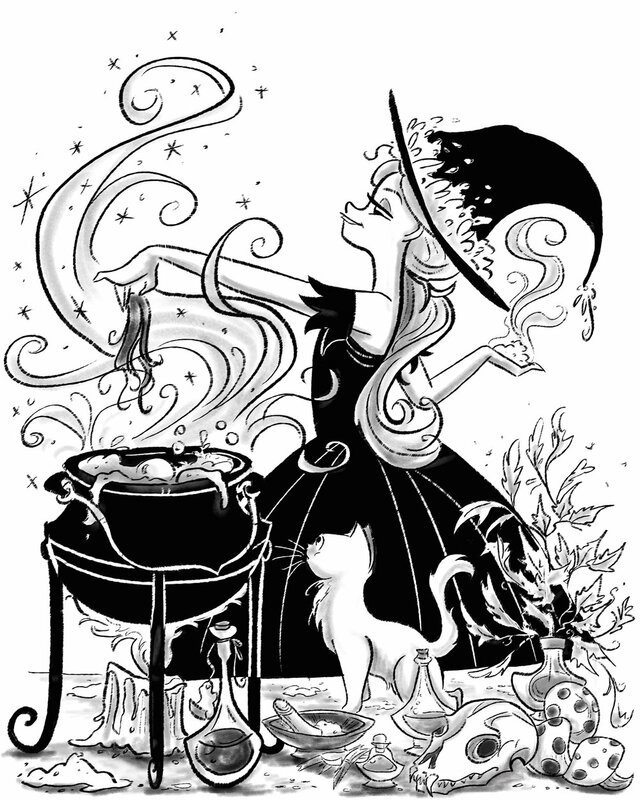 Using line work and black with just a bit of grey wash.
Been keeping with the October theme, I been doodling a witch and her kitty and their daily day doings. Sometimes the witch and the kitty would be doing things most people are doing in October. I been to trying to be more fun with my characters and play with body and facial expressions. In addition to doing paper art, I am enhancing my digital skills, by working in a more painterly style. Here I use a blur effect to give the piece more depth. Here is an impressionist look at nature. I'm always trying to bring light into my pieces. Its something I love about digital art. Here are some digital illustrations based on another favorite book of mine... The Fairy's Mistake and Other Princess Tales by Gail Carson Levine. I've always found Ms. Levine's writing to be so whimsical and witty. The book is an anthology of six stories. This is a tile page for the first story about a Fairy's spell gone wrong on twin sisters. I chose to do portraits of the main characters in each story. I love just doing grayscale pieces once in a while. This map of the Kingdom of Biddle is the environment in which all the stories take place. I had fun trying to "map out" all the locations in the stories. This illustration was created for The Fairy's Mistake and the second is for The Princess Test. I had great time using gradients to capture light. These pieces were conceived at the time I decided to open my Etsy shop. They are simple graphic animals created out of paper. I've always loved the gracefulness of birds but I find that other creatures are appealing in different ways. Whether it be the sensualness of an otter, the sweetness of a bear, or the elegance of a tiger, each has its own magical charm. Colors against a black background are very appealing to the eye, especially when the designs are simple and graphic. A personal goal of mine is to have better sketchbook habits. At MICA I admired the sketchbooks of my peers. Mine on the other hand was more a notebook than anything else, with chicken scratch thumbnails. So, in June I got this black sketchbook to experiment with. I chose it because starting off with white paper can be very intimidating. I began to include paper cut art in my sketchbook as well. Different from a planned piece, the work in the sketchbook does not begin with preliminary drawings. I collage from scrap pieces of paper I have left over from previous projects and build the piece as I go. I've always wanted to experiment with paint. I love how it looks as an accent to the paper. I'm finding however, that I can also work in the reverse and have the paper be the accent to the paint. These early works have been created from my imagination. Since a sketchbook is meant to travel with you, I've started to take this little black book with me to Sketch Night at the Society of Illustrators and create works based on the costumed models. With these sketches, I'm less concerned with trying to create a realistic or even accurate depiction of what I see but aim to create an interesting piece of work inspired from what I see. The models' poses last for 5 or 10 minutes. It takes me about 20 minutes to finish one piece. Sometimes I capture bits and pieces of the pose from the previous moment. The Society of Illustrators provides artists with folding trays to work on. I bring along a mini cutting mat measuring 8"x10", an x-acto knife and scissors, my travel gouache set and an extra-large ziplock bag with scrap pieces of paper. Emily Windsnap: Tells Her "Tail"
Every once in a while, I like to design cover illustrations for some of my favorite books. I did these two illustrations for the whimsical series, Emily Windsnap by Liz Kessler. I fell in love with mermaids after watching Disney's The Little Mermaid. The idea of being able to have both legs and fins like Emily would be great fun! In addition to paper cut art, I also enjoy doing digital painting. I like to base my digital work on color and shapes but the one thing I like the most about working digitally is the play between light and texture. I then like to add type and graphics to see what the piece would look like if use as a product. Adding typography to the illustrations gives them a completed look...like when you frame a piece of art work. It brings the piece to another level. "The Flair of Mary Blair"
This portrait of Mary Blair was created for the Society of Illustrators' Artist Illustrating Artist Show (Spring 2015). She is one of my idols!!! Her work has a great sense of color, charm and appeal that just pops off the page. Mary Blair is best known for her paintings for the Walt Disney Animation Studio. She worked on classic films like Alice in Wonderland, Cinderella, and Peter Pan. Although Mary Blair worked mostly in gouache she also did paper cut art. So in honor of her I decided to use both paper and gouache in my portrait of her. The whole piece measured 16"x 20". As part of it I made mini paper cuts of some of her classic pieces all measuring 2" x 3". This one is from Peter Pan. I had a lot of fun trying to adapt a painting to paper cut. I found it tricky when some paintings are so gestural versus paper cut art which is best done using major colors and shapes. On the left is my adaptation of the original painting she created for Cinderella. Alice in Wonderland is one of Blair's most beloved works. Also, "The Art and Flair of Mary Blair" by the amazing animator John Canemaker, is a must have on any artist's book self. When making a template for my paper cut pieces, there is still room for change as the piece come to life. I aim for clean lines in my drawing and sometimes will do a color mock, which tends to be very saturated. I still can change my mind based on what paper colors I have and what looks right. When I have an idea, I sometimes scribble it on a post -it note before sketching it on paper. Then I'll scan it into the computer and draw it digitally so I have clean lines to work from. In the Fall of 2014, I interned at Dial, an imprint of Penguin Random House. I learned a lot about children's books. In seeing all the beautiful illustrations, especially the collage work, I started experimenting with paper again. These are birds I created for the "little birdies" at Penguin, who were so sweet to take me under their wing during my time at Dial. I'm editing my website and decided to add a blog page. Here is a little banner idea I came up with a while back. This a reflection of my work table and my "little studio helper".